Thanksgiving Printables and Gift Ideas for More Fun and Thankfullness! ...Thanksgiving favors, for sharing with friends or for Thanksgiving hostess gifts. In the spirit of being thankful, I thought I'd make the task a little easier for you, by designing and sharing some Thanksgiving printables for you to use with a variety of DIY homemade Thanksgiving gift ideas. Candy Jar. This is a nice simple idea! Fill a jar or bag with festive candy and attach your new homemade gift tag (printable below)... a simple, sweet and effective gift of Thankfulness. 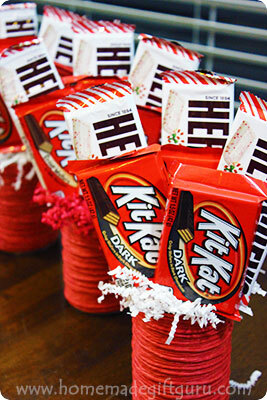 Candy Arrangements. 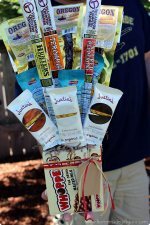 Make a beautiful potted candy arrangement... these easy candy bouquets are super sweet, very cute and they double as Thanksgiving decorations for the person you give them too. Gifts in a Jar. 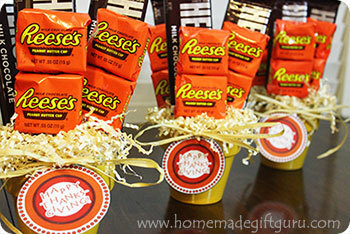 My absolute favorite time to give homemade gifts in a jar is Thanksgiving! They make great Thanksgiving hostess gift ideas... After all, what better time to give a delicious food gift mix than the end of November... knowing that December will be full of shopping, more hosting and my favorite... FAMILY TIME! Homemade Kahlua Coffee Liqueur. 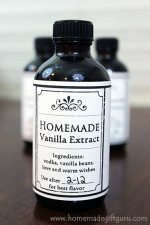 Homemade Kahlua liqueur gifts... another great Thanksgiving hostess gift idea! It's Kahlua and it's a get-together... need I say more? Bonus... if you made the Kahlua right before Thanksgiving, you can tell your gift recipient it will be aged nicely by Christmas! They can enjoy it Christmas Eve or even New Years, if of course, they have the self control to wait. Food Gifts. Bake some delicious treats and wrap them up in an awesome re-purposed canister or a super elegant homemade clear top gift box. Wine. Wrap the neck of a bottle of wine with raffia and attach a Happy Thanksgiving gift tag (tag below) for a simple gift of thankfulness for your friend and/or host. Gift Baskets. 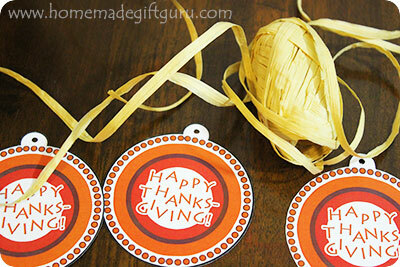 Use a Happy Thanksgiving gift tag to decorate a homemade gift basket. 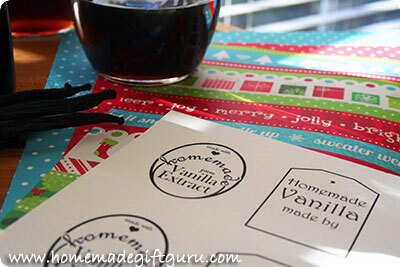 Below you will find an easy to print Happy Thanksgiving printable gift tag, enjoy! Please note that these are my exclusive gift tag creations. 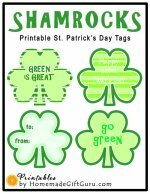 All tags and printables copyright © 2009-2018 www.homemadegiftguru.com and provided for personal and gift giving use only. All Rights Reserved. 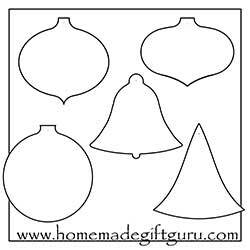 I can't wait to make some more free printable gift tags for Thanksgiving... until then, you may also like the free printable gift tags here. They were designed to go perfectly with homemade gifts!